Save & embellish your Christmas cards for decor year after year. 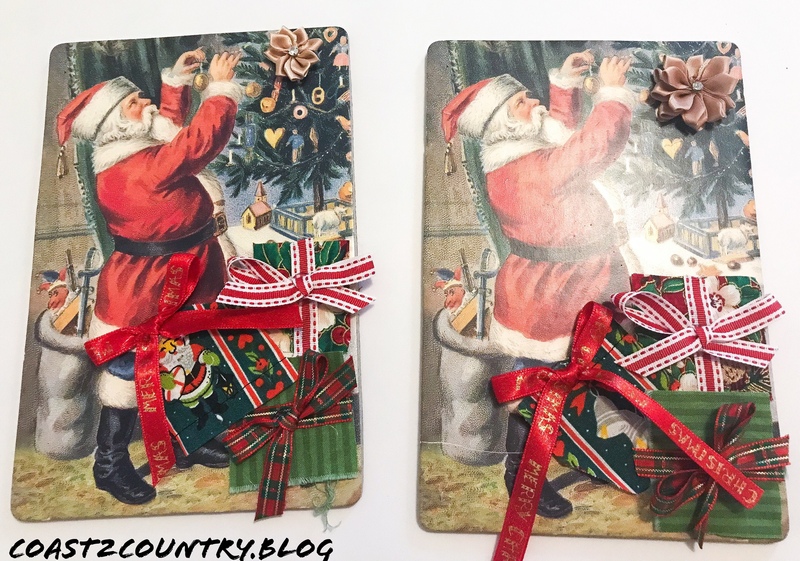 I found two vintage christmas cards that were damaged and wanted to give them a new life. Start by tracing the card into the cork, cut out and glue the card to the cork board with your spray adhesive. Add your accent piece onto the card with craft or hot glue. Cut 3 squares of fabric for your presents proportional to your card. Glue in place. Cut the ribbon the width of your square presents. Glue on top. Tie ribbon bows and glue on presents. Tip: Use a small easel to display your card. Or hang on a card tree. Join my Facebook group Coffee Craft and share your Cards!